In the Eclipse Platform a Perspective determines the visible actions and views within a window. Perspectives also go well beyond this by providing mechanisms for task oriented interaction with resources in the Eclipse Platform, multi-tasking and information filtering. In this article the concepts behind perspectives are examined. The process for perspective definition, extension and instantiation will also be covered in detail with coding examples and sample scenarios. In the Eclipse Platform there are two main layers: the model layer and the user interface layer. The underlying model, known as the Workspace, is a collection of resources (projects, folders and files). The user interface, or Workbench, defines the presentation for those resources. Within the workbench the Perspective feature is used to control the visibility of items in the model and the user interface. It controls what you see in the model (which project, folder or files) and what you see in the user interface (which actions or views). These controls make it possible to navigate through and modify the workspace in a way which suits the user task. In this article the perspective concept will be explored in detail. In particular, we'll look at how it relates to task oriented interaction, multi-tasking and information filtering. We'll also look at the techniques to define a new perspective, extend an existing perspective, or instantiate a new perspective at runtime within the workbench. Coding samples are provided for each technique. A perspective is a visual container for a set of views and editors (parts). These parts exist wholly within the perspective and are not shared. A perspective is also like a page within a book. It exists within a window along with any number of other perspectives and, like a page within a book, only one perspective is visible at any time. Each perspective has an input and a type. The input attribute is used to define which resources are visible in the workspace and the type attribute is used to define which actions and views are visible in the user interface. This design is a reflection of 3 key concepts. Each of these will be covered in detail below. But before getting into the details, let's explore the idea of input and type. On startup the workbench will most likely consist of one window with one perspective. For instance, the window may contain a Resource perspective on the entire workspace. This perspective has input = the Workspace and type = Resource. If you select a project or folder in the Navigator you can open a new perspective by invoking Open Perspective > Java™ from the object context menu. This new perspective has a different input and type: input = the Project and type = Java. Now there are two perspectives. The visible resources in the second perspective are a subset of those in the first. Each perspective contains a set of views and editors which exist wholly within the perspective and are not shared with the other. These parts define the presentation for a shared, underlying model. In a large, real world project the Eclipse Workspace may contain hundreds or thousands of resources. For instance, consider the following project in Eclipse. It may be small, but this project represents a typical three tier B2C web application. There are three folders: ClientSide, MiddleTier and DatabaseServer. Each folder represents a different tier in the application. The files types in each folder are also different. The contents of this project are very typical of application development in the Internet age. No single language or technology can do it all, and software development involves the application of many technologies rather than just one. An important tool for comprehension is information filtering. In other words, remove the irrelevant so you can see the relevant. In Eclipse this is performed in two ways, by using the inherent structure of the information (the resource tree) and the unstructured attributes of the information (file name, nature, resource type, etc.). For this discussion only the first style of information filtering is relevant. In a large project the resources are usually structured within a hierarchy. The workspace contains many projects containing many folders containing many files. It's a tree, and each subtree within the whole defines a physical subset of information. This idea is the basis for information filtering within the workbench. The user can open a perspective on any resource subtree within the workspace. In the resulting perspective only the children of the subtree root are visible. The subtree root is known as the input. For example, if you open a perspective on MiddleTier within the WebApplicationProject only the children of MiddleTier are visible within the resulting perspective. The input = MiddleTier. As a development platform Eclipse was designed to fulfill the needs of a large product development team, from product manager to content developer to product tester. It is fully extensible and may be configured with hundreds of action, wizard, view and editor extensions for any number of languages, tasks, roles, and phases within the development life cycle. In other words, it may contain a lot of junk you'll never use. To avoid the visual overload and confusion which would occur if everything was visible in the UI some mechanism is required to filter the user interface. In Eclipse a task oriented approach was taken to filtering. Consider a Java developer. Within a single development cycle a Java developer may iterate through the following phases: Analysis and Design, Implementation, Debug, Testing and Documentation. In one phase the developer may use a UML modeling tool. In another you use a Problem Reporting tool. The time spent in each phase will vary but rapid transition between phases may occur several times a day. If we say that each phase is a "task" then it is possible to say there is rapid transition between tasks. In addition, the preferred way to look at resources in the workspace will change with the active task. In Eclipse task orientation is embodied by perspective type. A perspective determines the visible actions, views, and view layout within the window. There are many types of perspective, and each one defines the layout in a different way. Ideally, the layout should be tailored to suit a particular set of related tasks. For instance, the standard Eclipse platform includes a Java perspective and a Team perspective. The Java perspective defines a layout containing the Package, Hierarchy, Outline and Tasks view. This is useful for java development. The Team perspective defines a layout containing the Repositories and Synchronize view. This is useful for code sharing and versioning. In Eclipse the user can open a new perspective with a particular type, switch from one perspective to another with different type, or change the type (layout) of an existing perspective as they move from one task to another. In an earlier section we saw how information filtering can be used to limit information overload. When information filtering is implemented a new need develops: the need to see information which is not visible. For instance, a Java developer may explore one class hierarchy while they modify code in another. In Eclipse this functionality is provided by opening a second perspective on the information required. The ability to create two separate perspectives (or more) makes it possible to switch between information without loss of context. The ability to open more than one perspective is also crucial for multi-tasking support. Developers often multi-task without even knowing it. For instance, in a team environment a coworker may walk into your office to ask a question. In response, you open up a class hierarchy and explore the code for a few minutes. This is a new task and it should have no impact upon your previous task. It demands good task separation. In Eclipse the creation of the second task can be accomplished by just opening a new perspective. When the task is complete you can close the perspective and return to the old task without loss of context. At a conceptual level a perspective is quite simple. A perspective is a visual container for a set of views and editors. It has an input and type. A perspective is also like a page within a book. It exists within a window along with any number of other perspectives and, like a page within a book, only one perspective is visible at any time. At the implementation level things become more complex. The platform user interface is exposed through a series of interfaces in org.eclipse.ui. The root of the user interface is accessed by invoking PlatformUI.getWorkbench( ). This returns an object of type IWorkbench. A workbench has one or more windows of type IWorkbenchWindow. And each window has a collection of pages of type IWorkbenchPage. In the user interface a page is known as a "perspective". Within each window there is at most one active and visible page. The structure of the workbench is exposed within the following diagram. The workbench window is outlined in red. Within this window there is a single open perspective. It's purple. But to be truly accurate, the user calls it a "perspective". At the implementation level it is an IWorkbenchPage. While the workbench is running new windows and pages can be created interactively by invoking Open Perspective from the window menu or from the Navigator context menu. A page can also be created programmatically using public API on IWorkbenchWindow. For instance, the following code demonstrates the creation of a new page. // fWindow is an IWorkbenchWindow. In this example the two parameters to openPage identify the perspective type and input, in that order. The perspective type is identified by a string. Each perspective has a unique id. 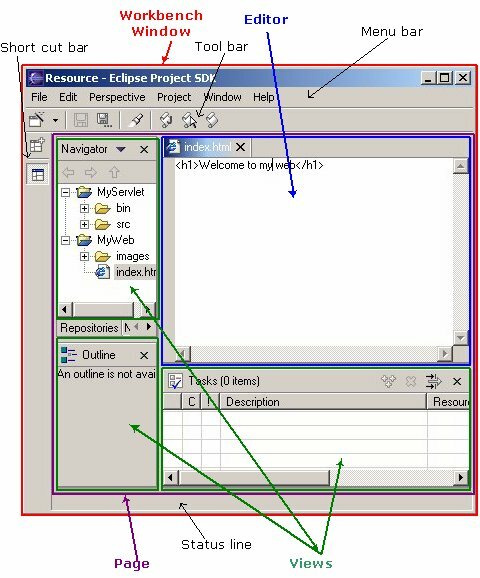 In this case "org.eclipse.ui.resourcePerspective" identifies the Resource perspective. The perspective input may be any object of type IAdaptable. In this case the input is the entire workspace. The openPage method creates and returns an object of type IWorkbenchPage. Given a page, you can get the input and perspective type by using the following methods. There is an interesting twist here. When a new page is created you identify the perspective type by id. In the openPage method the id is mapped to a perspective descriptor within a list of known perspectives types and the result is stored within the return page. The getPerspective method on IWorkbenchPage returns an object of type IPerspectiveDescriptor. This object has accessor methods for the perspective id, label and icon. The page input determines which resources are visible in the page. In practice, resource visibility in a page is implemented through collaboration between the page and the views within that page. The page itself is a visual container for views and editors. It doesn't provide any presentation for resources. That is delegated to the parts within the page. The hand-off usually occurs during part creation. In the early stages of part life cycle a part can obtain a handle to the containing IWorkbenchPage and from this it may call getInput. The result will be used as the initial input for this view. For instance, if a new perspective containing the Navigator is opened the Navigator will use the page input as its own input. The Packages view does the same. In some cases the view may provide additional actions to dynamically change the view input. In the Navigator the Go Into, Go Up, Go Back, and Go Forward actions can be used to navigate around the workspace tree. The perspective determines which views are visible in a page. For instance, if you open a new page with the Resource perspective the Navigator, Outline, and editor area will be visible. If you open a new page with the Java perspective the Packages, Hierarchy, Tasks, and editor area will be visible. The visible views are determined by the perspective type. The type also influences the visible action sets within a page. For instance, the Java and Debug Action Sets are typically visible in the Java perspective but not in the Team perspective. This influence will be discussed in greater detail in Adding a New Perspective. Within the workbench a new perspective can be defined in two ways. An ISV can add a new perspective using the perspective extension point in the plug-in registry. A user can add a new perspective or override an existing perspective by using the customization and persistence features built in to the Eclipse user interface. This section will focus on the ISV scenario. The definition of a new perspective is a three step process. Add a perspective extension to the plugin.xml file. Define a perspective class for the extension within the plug-in. This process will be illustrated by defining a plugin with a perspective called "Test". The Test Perspective will contain the Navigator View, the Outline View, and an editor area. The layout for the perspective is illustrated in the quick sketch below. In the first step a new plug-in is created. The process of plug-in creation is explained in detail in Your First Plugin, by Jim Amsden, so I won't go into the details here. For this article I created a Perspective Plugin with following plugin.xml file. The org.eclipse.ui plug-in defines a single extension point for perspective contribution: org.eclipse.ui.perspectives. A new perspective is added to the workbench by defining an extension for this point. In the example below a perspective extension is defined for the Test Perspective. This declaration contains the basic elements: id, name and class. A complete description of the extension point and the syntax are available in the developer documentation for org.eclipse.ui. The attributes are described as follows. class – a fully qualified name of the class that implements org.eclipse.ui.IPerspectiveFactory interface. Perhaps the most important attribute in the perspective declaration is class. This attribute names a class that will define the initial layout for the perspective. 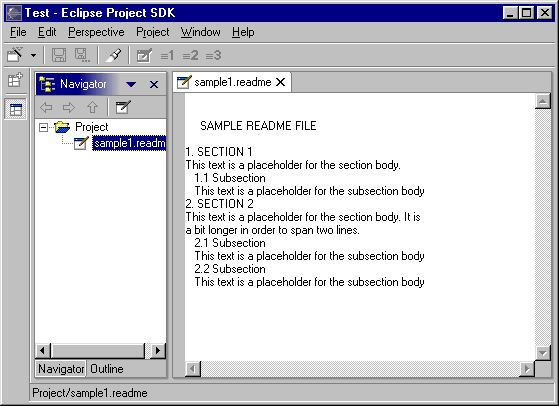 In this example the layout for the Test perspective is defined by org.eclipse.ui.articles.perspective.TestPerspective. The implementation of TestPerspective will be examined in a few paragraphs. Once a perspective extension has been declared for the Test Perspective it will appear in the Perspective > Open menu and in the Open Perspective menu of the Navigator. If the user invokes either of these actions a new workbench page will be created. During this process the following steps are taken. A new IWorkbenchPage object is created with perspective id = "org.eclipse.ui.articles.perspective.Test". The perspective id is used to lookup the actual perspective extension in the plugin registry. Within the workbench a list of the registered perspective extensions are stored within the IPerspectiveRegistry (available from the IWorkbench interface). The findPerspectiveWithId method is called to get a complete description of the perspective. This method returns an object of type IPerspectiveDescriptor. The perspective class is retrieved from the IPerspectiveDescriptor. This class must implement IPerspectiveFactory. An instance of the perspective class is created, yielding a IPerspectiveFactory. The createInitialLayout method is called on the IPerspectiveFactory. This method defines the initial layout for a page. Implementors may add views, folders, actions and action sets to the page layout. The IPerspectiveFactory is dereferenced and is not used again during the life cycle of the page. In the next few paragraphs we'll concentrate on point # 5. When createInitialLayout is called on an IPerspectiveFactory the page layout consists of an editor area with no additional views. Within createInitialLayout you can add views, folders, and view place holders to the page layout. A folder is a stack of views. A place holder marks the position of a view within the page. The view itself is not initially open, but when opened will occupy the position marked by the place holder. In the example below you can see how createInitialLayout is implemented in the TestPerspective class. For clarity the algorithm has been split into two parts which define the actions and layout: defineActions and defineLayout. In defineActions a number of items and action sets are added to the window. A perspective may add items to the File > New, Show View, or Perspective > Open menus of the window. You can also add complete action sets to the menu or toolbar of the window. In this example a few File > New and Show View items are added. In defineLayout the TestPerspective factory adds two views to the layout. When createInitialLayout is called the page layout consists of an editor area with no additional views. Additional views are added using the editor area as the initial point of reference. In defineLayout the factory gets the id of the editor area. Then it creates a folder to the left of this area and adds the Navigator view and Outline view to this folder. // Editors are placed for free. The createFolder method adds a new folder to the page layout. The position and relative size of the folder are expressed as a fraction of an existing part. In the example above a folder is created with the name "left". It is positioned to the left of the editor area and occupies 26% of the original space of the editor area. The positioning constants are defined on IPageLayout, and include TOP, BOTTOM, LEFT and RIGHT. In some situations a perspective within one plug-in may be referenced by another plug-in. For convenience, the unique id for each perspective should be declared on a public interface in the source plug-in. The unique id is usually derived by concatenating the plug-in id with some plug-in unique perspective id. For instance, the following approach was used for the Perspective plugin and perspective. The Test perspective is now ready to use. To test the new perspective I installed the Perspective plugin in the Eclipse plugins directory and then restarted Eclipse. From the Perspective > Open > Other... dialog I selected the Test perspective. After pressing OK the following page appeared within my window. Why is Layout Declaration done in Code Rather than XML? During the design of perspectives both options were considered. Within Eclipse XML is typically used to declare the presence of an extension and the circumstances under which it should be loaded. The information is used to load the extension and its plugin lazily for better startup performance. Now let's apply this logic to perspectives. When a perspective is selected from the Open Perspective menu the load conditions are met, so we can load the extension and move forward using Java. Java code provides the benefits of code completion and error detection at development time. Can I Remove the Editor Area Completely? In some scenarios the ideal layout for a perspective may be made up of one or more views with no editor area. To achieve this you can invoke IPageLayout.setEditorAreaVisible(boolean) to hide or show the editor area. This state will be honored unless the user decides to override it from the Perspective menu. As a philosophical point, wouldn't it be great if you could punt the editor area completely? In fact, the workbench user interface favors the user more than the ISV. While the ISV may wish to define a closed environment with a fixed set of views, the user always has the ability to show any view from the Perspective > Show View menu. If the user can show any view they can also open any resource in an editor, and this necessitates an editor area. This underscores a very important point. A perspective definition is just a suggestion. The user can override it at any time and probably will. For more information on this idea see User Customization and Persistence. Do I Need a Perspective? The temptation to create a new perspective is strong. The dark side beckons. As an ISV, if you add a view extension to the platform you'd like some way to make it visible. One way to do that is to copy an existing perspective, say the Resource perspective, and add your view to the factory class. If every ISV took this approach the user would soon be overwhelmed by perspective choices. In all likelihood the user would ignore them all and create their own. In general, a perspective should only be created when there is a certain group of related tasks which would benefit from a predefined configuration of actions and views. For instance, the Java Perspective is a good context for the completion of Java related tasks. It contains a Packages view and Hierarchy view for class navigation. The Tasks view is good for problem navigation. And the Outline view is useful for navigation within an editor. Together, these views are useful for many Java oriented tasks and the creation of a Java Perspective is justified. In some situations it may be better to augment an existing perspective. For instance, if you create a single view which is Java centric it is probably better to add that view to the standard Java perspective rather than defining a new perspective. This strategy provides better integration with the existing platform. For more information on this process check out Extending an Existing Perspective. In the previous section we examined the techniques an ISV would use to add a perspective to the workbench. The user can also add a new perspective to the Eclipse user interface or override an existing perspective. This section will focus on those aspects of user customization. When Eclipse is installed the plug-in registry contains a number of perspective extensions. These extensions are contributed by plug-ins from various ISV's and form the initial set of perspectives available to the user. In my own experience the perspectives contributed by an ISV usually fail to completely meet my needs, so I quickly customize them. I add views, remove views, add action sets, customize the menus, etc., until the user interface reflects the way I work. Then I save the new layout to the original perspective. The initial layout for a page is determined by the perspective. To be more precise, it is determined by an IPerspectiveFactory as explained in Adding a New Perspective. Once a page is open the user may modify the part layout or the visible action sets within the page. If this page is closed the new layout is discarded. However, if this page is open when the workbench is closed the state of the page (and in fact every window, page and part) is saved to an XML file in the org.eclipse.ui plug-in. This file is used to restore the state of the page when the workbench is restarted and contains every important attribute of the page: the visible views, their layout, the visible action sets and other state attributes. In fact, the IPerspectiveFactory which defined the initial layout for the page is not consulted when the page is restored. The user can also create a new perspective by invoking Perspective > Save. In response a dialog appears where the user can type a user friendly name for the new perspective. Depending on the option chosen by the user, this action will create a new perspective with the layout of the current page or override the layout for an existing perspective. The resulting perspective has all of the privileges of an ISV perspective. The user can open a page with the custom perspective, use it as the default perspective, or delete it. The layout of the custom perspective is saved as an XML file using the same mechanism described above for workbench session persistence, so there is no IPerspectiveFactory. In the workbench a new perspective can be created interactively by the user or programmatically through public API on IWorkbench, IWorkbenchWindow or IWorkbenchPage. 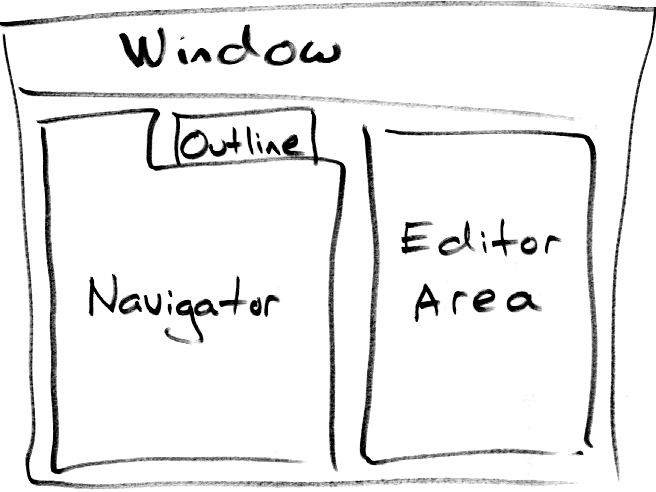 For instance, the user may select a container in the Navigator and invoke Open Perspective > Java. This is an explicit command from the user to the view to create a new perspective. A new perspective may also be created as a step within some other action. For instance, if Project > Open Type is invoked an option exists to open a new Hierarchy Perspective. In this section the implementation of both will be discussed. In the Navigator a user may open a new perspective with specific input and type by invoking Open Perspective from the context menu. This ability is an important element of information filtering and should be included in any view where the resource tree is visible. This will lead to user interface consistency and ease of use. The easiest way to add Open Perspective functionality to a view or menu is with the OpenPerspectiveMenu. This class is supplied in org.eclipse.ui.actions and can be included in any popup menu. For instance, the following code demonstrates its use within the Navigator. * Add "open to" actions to the context sensitive menu. // If one file is selected get it. // Otherwise, do not show the "open with" menu. // Create a menu flyout. In this example the popup menu for the navigator is populated dynamically just before the menu is about to show. The fillOpenToMenu method is called from within menuAboutToShow. If the selection is a container (project or folder) the Open Perspective submenu is created and then populated automatically using the OpenPerspectiveMenu. The contents of this submenu are determined by the customized settings of the active perspective. For instance, if the Perspective > Open menu contains "Resource, Java, and Team" your context menu will also contain "Resource, Java, and Team". In the workbench the behavior of Open Perspective in flexible. In fact, the user can configure this behavior in the workbench preferences. The "Open a New Perspective" behavior may be defined as "Open in Same Window", "Open in New Window", or "Replace Current". The meaning of "Open in Same Window" and "Open in New Window" are obvious. The meaning of "Replace Current" is less so. Each page has a perspective. If "Replace Current" is invoked the active perspective within the page is replaced by a new perspective. This causes the view layout and visible action sets within the page to change, and is equivalent to changing the layout in MS Studio. The OpenPerspectiveMenu class implements the preferred behavior for "Open Perspective" and supports the selection of alternate behaviors when the Control or Shift keys are pressed. After the addition of an OpenPerspectiveMenu object to the context menu no other action is required to implement the Open Perspective behavior. A new perspective may also be created as a step within some other action. For instance, if Project > Open Type is invoked the implementing action will open a new page with the Hierarchy perspective. In this scenario a new IWorkbenchPage must be created explicitly using the API's available on IWorkbenchWindow. The following code illustrates this process. In the code above the active workbench window is retrieved and then openPage is invoked with a perspective type and input. As we saw in Adding a New Perspective, the id of each perspective should be exposed on a public interface in the source plug-in for convenient access by other plug-ins in Java code. In this example the Test perspective id is referenced from the IPerspectivePlugin class. The perspective id is mapped to an IPerspectiveDescriptor within the perspective registry. Then the page is opened. If any problems occur during the creation of the page an exception will be thrown. As a philosophical point, should a hard coded constant be used to specify perspective type? In my own experience it is difficult to predict the usage pattern for any perspective. For instance, one user may prefer to develop java code in the Java perspective. Another may prefer to develop java code in the Resource perspective. If a hard coded constant is used to specify a perspective type the user may become frustrated if the wrong perspective is chosen. It may be better to let the user choose the perspective type or disable this behavior completely. If you need to open a perspective from within an action there is one detail to be aware of: the user may change the default behavior for Open Perspective in the workbench preferences. In most scenarios your action should honor this preference. To demonstrate the use of the Open Perspective preference I created an Action Set containing one action: "Open Test Perspective". When this action is invoked a new Test Perspective is opened using the preferred behavior. At the implementation level the action implements IWorkbenchWindowActionDelegate. Within the run method the preference is retrieved from the workbench plugin and then the perspective is opened. Here is an snippet containing the relevant details of my action delegate class. // Get "Open Behavior" preference. In many scenarios the extension of an existing perspective is a good way to introduce new action sets, wizards, or views into the workbench. For instance, as an ISV you may create a new Java centric view to the workbench. Rather than defining a new perspective to show off your view, you can extend the standard Java perspective. This strategy provides better integration with the existing platform. In this section the details of perspective extension will be covered. The extension of an existing perspective is a three step process. Create a plug-in for your extensions. Define an action set or view extension in the plugin.xml file. Add a perspectiveExtension extension to the plug-in registry. This process will be illustrated using the Test Perspective which was defined in a Adding a New Perspective. The first step is to create a plug-in with an action set or view extension. In this example I chose to reuse a few extensions which already exist within org.eclipse.jdt.ui (the Java plug-in). This plug-in defines a Java Action Set, a New Java Project Wizard, a Packages View and a Hierarchy View. The org.eclipse.ui plug-in defines an extension point for perspective extension: org.eclipse.ui.perspectiveExtensions. This extension point can be used to contribute any of the following objects to an existing extension perspective. In the following example the extension point is used to add the Java extensions discussed above to the Test perspective. In the first two lines of XML the target perspective extension is declared: org.eclipse.ui.articles.perspective.TestPerspective. Following this the specific extensions for this perspective are declared. An action set is added. Then menu items for Show View, File > New, and Open Perspective are added. And then the Packages view is stacked on top of the Navigator. In the next few paragraphs a brief description of each element within the perspectiveExtensions extension point is provided. A complete description of the extension point and the syntax are available in the developer documentation for org.eclipse.ui. In the example an actionSet, viewShortcut, newWizardShortcut and perspectiveShortcut extension are demonstrated. The format of these elements is very simple. There is one attribute, id, which identifies an existing extension which should be added to the perspective. It must identify an action set, view, wizard, or perspective which has been registered using the standard extension point for each. The XML for view extension is a little more complicated. A new view may be stacked on or placed relative to an existing view. Minimally, you must define an id (of the view being added), relative id, and relationship ( left, right, bottom, top, stack ). If the relationship is not stack a ratio must also be supplied. This will be interpreted using the same heuristics as IPageLayout.addView(id, relationship, ratio, refID). In the current implementation of perspective extension there is one limitation. Perspective extension is only possible when the user has not modified the default layout for a perspective. If modification has occurred perspective extensions will be ignored. However, given the customizable nature of the workbench the user can always introduce an action set or view into the perspective by invoking the Perspective > Customize action or by opening a view from the Perspective > Show View menu. In this article we have examined the role of perspectives within the workbench and their implementation. Perspectives are complex and will certainly evolve over time. Hopefully this article will get you started. Further information is available in the Platform Plug-in Developer Guide and in the javadoc for org.eclipse.ui.